As I sit here there's a lot of you buried under A LOT of snow. I'm sure you've loved the extra day or two away from work, but are ready for a warm up and a little less snow. If it makes you feel better, I so wish Denver had gotten dumped on! We didn't get anything. I love the snow, minus the shoveling when Brad's out of town. How is it he's missed every snow we've gotten this season so it's me doing all the back breaking work?! Oh Mother Nature, you have a funny sense of humor. She knows I need to work out and have been putting it off. I know it feels like a long way off, but it's almost February and spring will be here before we know it. So to help you forget about the snow and cold weather, I'm bringing you homes and buildings with living walls. You might be asking what a living wall is, just think climbing vines, grass and flowers. It's one thing to have planters, but by having something living on your home, brings curb appeal to a whole different level. I'm just going to lay it out here though, I have a brown thumb so don't even begin to ask me how to start this on your home. My suggestion is to go to your local nursery. 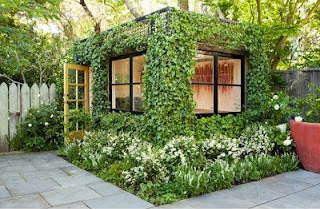 The "simplest" way to achieve a living home is to have climbing vines on your home. I say "simplest" because I have no idea how simple this is to grow, but my assumption would be with some good planning and patience, you could achieve this on your home in a few years. Remember, patience though!! It's amazing how just a simple black garage door and some vines can have such an impact. I love this little building, it's an old shipping container. I could imagine this being an office, an art studio, or just a place for mom to have a "time out". yes please!! Perhaps having a lush home isn't for you, you can still get a strong impact even if the vines don't cover the entire home. i can't wait to have the windows open!! if this home was in arkansas in spring there's no way the windows would be open, everything, and i mean everything would be yellow inside. Wanting a romantic home? Try climbing flowers. They're not only gorgeous and smell wonderful, but your significant other will love it because they won't have to go out and buy flowers when they mess up anymore. Ok, so these next few photos are extreme. I love them, but to put them in a residential setting it must be done properly or your home will just look like a deserted house. I imagine this mostly in a modern setting, by an outdoor patio on one wall, or an entire back wall of your backyard. Perhaps also, even right when they step on your front stoop, on one wall. Remember, keep an open eye. i love the different textures and shades of green. also by having accent lighting helps accentuate the wall that much more. Imagine if you didn't have to tell someone your address. You could just say, "oh I live in the red flower house" or "the house with a pink roof".